Armoured Spearmen from the 6th-7th Century AD. Suitable for all Sub-Roman/ Arthurian Armies. Figures have seperate shields that need attaching with glue. Spears are not provided in the pack. 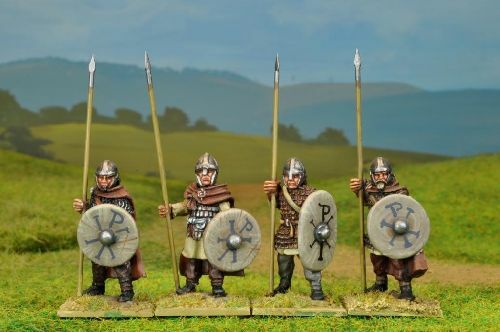 You can buy spears separately, the most suitable set for these figures being NSS102. Figures supplied unpainted. Painted examples here painted by Jim Bowen.